A 0861 Word Number is a telephone number that spells out a word and can be dialed from both a landline or a cell phone. Your product, service or company name can now become your telephone number! A Word Number makes it easy for people to call the companies they want to do business with. 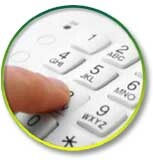 Potential customers simply dial 0861 followed by the Word Number using the letters on their telephone keypad. If you wanted to dial 0861-WORD NUMBERS, you would dial 0861, and then the corresponding keypad numbers for each letter. For example, 9 for the letter W, 6 for the letter O, and so on. The corresponding phone number for 0861-WORD NUMBERS is 0861-967 368. It's not like typing out an SMS on a cell phone, because you don't need to toggle through a key to select a particular letter. To dial a letter, you only need to press the corresponding number key once. A word number is a long term advertising tool that enables ease of expansion, marketing initiatives and/or changes of location. Your customer will not be negatively affected by any changes within your organisation - always being able to get hold of you with ease. Should you have multiple branches a word number is the answer. Your national number means that consumers can get hold of you with ease. It also eliminates the dilemma in trying to find sufficient space in your ads to display all your branches/franchises contact details. One national number translates into 'efficiency'. Should you be based in a specific region/s, there is no reason why your company should lose out on sales in other regions. Consumers are often 'put-off' from contacting companies if they perceive you are not based in their area - don't be limited by your region-specific number. Word Numbers are easier to remember than regular phone numbers because people remember words much better than they do numbers. Once someone knows your telephone Word Number, he or she no longer needs to look you up, and your competitors will lose the opportunity to divert business away from you. As advertising with word numbers generates more leads for the company, the cost of generating each of these leads drops. People are far more likely to remember your word number after seeing your ad - this means they are more likely to call. Every time someone dials a Word Number, they're dialling a word that describes the products and/or services they're looking to buy.